Just seven kilometers south of the town of Chios lies the village of Thymiana. It is amongst the largest settlements of Chios with approximately 1600 inhabitants. The village used to be known as “Efthymiana,” meaning a place renowned for its many quarries from which the renowned “Thymianousiko” stone (red ochre in color) was extracted. The Thymiana stone is an excellent decorative substance for buildings. It was used in building mansions and churches in Kambos and is continued to be used today. 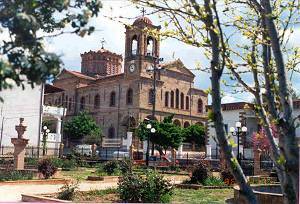 The village of Thymiana maintains a primary school, sports associations, yacht club, cultural club as well as the large church dedicated to Aghios Efstratios. The “resorts” of Thymiana include Aghia Ermioni and Megas Limnionas. Megas Limnionas is renowned for its fine, sandy beach. Located approximately 3 kilometers from the village, they are comprised of many summerhouses, most of which belong to the inhabitants of Thymiana. Over the last few years, the area became known as a result of its expansive development of tourism with the establishment of rooms for rent, small hotels, taverns, cafeterias and bars.